Roses are Red… So is Rioja! 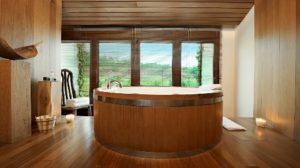 Treat your beloved to a romantic break in the luxurious surroundings of the stunning 5* Marqués de Riscal in the Rioja wine region. To book the below trip, please contact is on +44 (0) 1920 46 86 66 or at info@grapeescapes.net. Upon arrival in Elciego, check into your preferred room grade at Marqués de Riscal, a luxury 5* hotel located in the picturesque vineyards. Romantic room welcome upgrades such as Champagne with strawberries and chocolate, or a dozen red roses are available subject to a supplement. The remainder of the day and evening will be free for you to relax and enjoy your pleasant surroundings. Please let us know if you would like us to reserve you a table for dinner in the hotel’s on-site Michelin-starred restaurant. 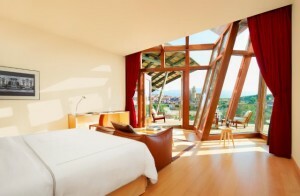 After breakfast, you will be taken on a tour of the Marqués de Riscal winery, which will conclude with a tasting. Marqués de Riscal is one of the oldest and most traditional of Rioja’s bodegas. Opening for business in 1860, the winery was most notable for its pioneering nature and innovative, non-conformist practices. together in the hotel’s luxurious vino-therapy spa. Following a fifty minute facial treatment in a private room, enjoy a bubbly barrel bath together, complete with exfoliating grape marc. This ultra-romantic moment will leave you both feeling fresh and exhilarated. Your afternoon of pampering will be concluded with a Caudalie massage for two: duo divine! 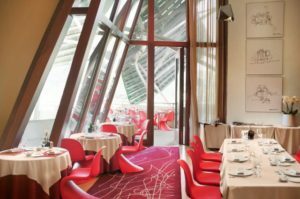 In the evening, a delicious five course dinner will be served in the hotel’s bistrot restaurant. Your meal will be accompanied by wine, water and coffee. The price of this package depends on which room grade you prefer. 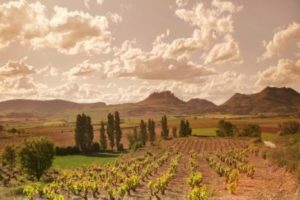 The prices below are per person, based on 2 people sharing a double room and include 2 nights’ bed and breakfast at Marqués de Riscal, a tour of the Marqués de Riscal winery and tastings, a romantic spa afternoon and a 5 course dinner with drinks. Please note the following points that relate to group quotes issued by Grape Escapes. This offer is valid for travel from Saturday 13th to Monday 15th February 2016. To secure your booking, full payment is required. Availability cannot be guaranteed until we have received confirmation that you wish to book your trip, together with your payment. If the named accommodation / visits are not available, we will endeavour to find suitable alternatives of a similar grade; this may be subject to a supplement or a rebate depending on the price available. Any mentioned timings and the order of activities in the proposal are indicative and subject to minor change depending the on the specific availabilities of our suppliers. Our full terms and conditions can be found on our web site at https://www.grapeescapes.net/terms-and-conditions/.